Looking for a well cared for, 1 owner, late model sportscruiser with room to spread out to get you and the family enjoying weekend getaways on the water? 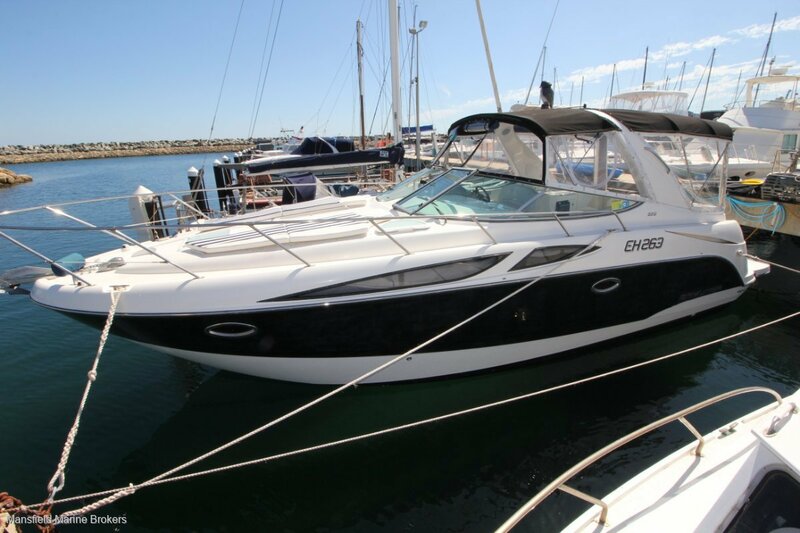 This spotless Bayliner 320 could be for you..
'BAYBE' is equipped with a pair of 5ltr MPI Mercruiser's and Bravo 3 drives. An extra large factory fitted swim platform and re boarding ladder has been added making access to the water a breeze. Moving forward into the cockpit area, ample seating is provided as well as a hot and cold wash down shower, sink and bar fridge. A removable table can make way for more room to move about and has an infill cushion to make a large cockpit sunbed. Plenty shade is provided with fully enclosed sides and breezeway screen throughout. There is 2 sun pads on the bow should you feel the need to work on that tan and down below is fully air conditioned. This boat offers comfortable seating for 10 and sleeping accommodation for 4, this comes in the form of a double bed fwd at the bow and another double bed in a private midship cabin at the aft of the saloon. The galley is neatly laid out with double electric burners, plenty of use full storage, a microwave, fridge and sink.